Kate Duffly is a scholar-director and community-based theatre artist with a Ph.D. in Performance Studies from the University of California, Berkeley. Her teaching and research interests include socially engaged and community-based theatre, 20th and 21st century American theatre, race theory and performance, acting, and directing. Kate has published articles in TDR, Theatre Topics, Theatre Survey, and Theatre Annual and is currently working on an edited collection that examines a broad array of performance practices rooted in community and explicitly engaged in negotiating difference and disruption. In addition to her own directorial and devised performance work, Kate has worked with Cornerstone Theater, Lunatique Fantastique, Touchable Stories, and Wise Fool Community Arts. In 2016, Kate received a grant from Oregon’s Regional Arts and Culture Council to create a community-based theatre project with community organization Western States Center and collaborator Roberta Hunte (Portland State University) about reproductive justice, titled We Are BRAVE. 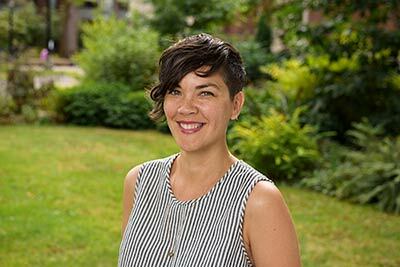 Kate is a board member for the August Wilson Red Door Project, which seeks to "change the racial ecology of Portland through the arts;" and Theatre Diaspora, Oregon’s only professional Asian American/Pacific Islander (AAPI) theatre company. Prior to her position as Assistant Professor of Theatre at Reed, Kate taught as lecturer at UC Berkeley and California College of Arts.